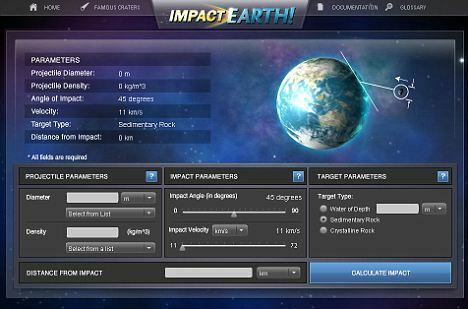 Impact Earth! End dystopia in a few seconds! Well, the other day we noted a new game called “Fate of the World” where you can do things such as plug-in your favorite mega-virus and wipe mankind off the planet. Today we get not a game, but a computer model kind of game brought to you by those fun science guys at Perdue University. Plain old mega-virus? Bleh! Now, if you do it right, you can kill off all life in a few seconds with a gigantic meteor strike! Yes! You too can end the dystopia on Earth! You get to pick the speed, the size, the impact angle, the mass, and even whether it hits on water, sedimentary rock or crystalline rock! What fun you can have! Create your own tidal wave and wipe out Miami! As a bonus you get a list of “Famous Craters!” They did forget Judge Crater, but his problem wasn’t asteroid related anyway, so no biggie. You can go here and play this fun game. I’m sure it will soon be played by warmers everywhere. Comments Off on Impact Earth! End dystopia in a few seconds! Asteroid passes 28k miles from Earth today. 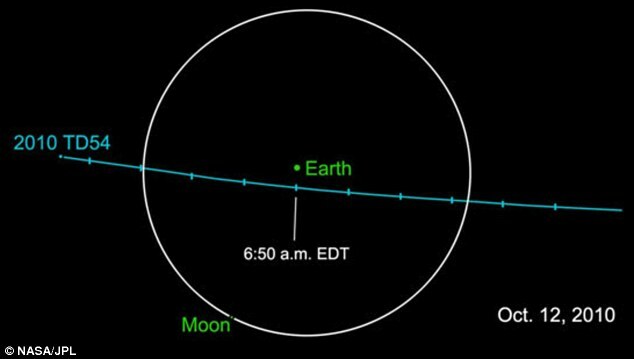 An asteroid the size of a double-decker bus is set to skim past Earth today – but the good news, according to Nasa, is that it has no chance of colliding with the planet. The space rock, labelled 2010 TD54, will reach its nearest point to Earth – approximately 28,000 miles away – around midday, although it is unclear what its exact course will be. However scientists have said that despite its close proximity to the planet it will not enter the Earth’s atmosphere and, if it did, it would be most likely to burn up before reaching the ground. So, perhaps global warming isn’t so urgent warmers. Perhaps we’d be better off spending those trillions on a method to destroy asteroids before they destroy us. Comments Off on Asteroid passes 28k miles from Earth today. If global warming terrifies you look at this! Created by British astronomer Scott Manley, the three-minute clip – which is the equivalent of two months per second – starts with a sprinkling of white ‘dust’ around the edge of the planets. Thirty years ago, we knew of just 8,954 within our solar system. Today, we have discovered 530,091 – forming a green ‘eye’ of minor planets. Well, I don’t know about you, but with 530,091 objects floating around out there I’d love to see some money spent on coming up with a way to divert one of these before it causes a mass extinction on Earth. For the whole story on how this was created please go to the source below. Comments Off on If global warming terrifies you look at this!